UT Austin's landscaping services manager John Burns holds up a photo of him (back row, second from left) and the team charged with controlling the campus grackles with blank-filled shotguns. You know what happens when you leave your car under a tree full of grackles? What your car looks like after a day or two? To hear John Burns tell it, there was a time when the University of Texas campus looked like that. John Burns was part of the facilities team who used shotguns filled with blanks to deter grackles' on-campus roosting. “It was horrible, and the stench was almost unbearable," Burns says. Burns is the landscape services manager at UT. He says, back in '80s, about 50 hours a week of work was put towards cleaning up after the birds ― more than a full-time job ― and workers were losing the fight. He says they tried all kinds of tricks – even rubber snakes, which they planted in trees to scare the birds away. "We tried a big balloon called a bird's eye, and it had a big eye," he says. "The size of a person's head." They’d float those around the trees also to scare the birds, but they did nothing. Fake owls – nothing. They even tried more natural routes – pruning the trees way back to discourage roosting. It's illegal to kill grackles. Killing them is also an ineffective "control" technique. It's best to dissuade them from roosting in certain areas. They played sounds of distressed grackle calls – nothing. Desperate times called for desperate measures. So, locked and loaded, Burns and the UT Facilities staff took matters into their own hands. He still has a file on it in his office. The years was 1990, Jon Bon Jovi’s “Blaze of Glory” was burning up the charts, and the UT landscaping crew put in an order for fifteen shotguns. Burns’ still has a picture of the group of men posing, looking pretty tough. "We’re all proud that we got our shotguns in hand. We also have a picture of our equipment we always wore – a vest to let people know that we were out there for a reason, not just out there with a shotgun, he laughs." The grackle shoots were parodied in this Daily Texan comic strip from 1990.
Credit Daily Texan cartoon from files of John Burns, UT Austin. They divided the campus into fifteen sections. The guns were loaded with blanks, called shell crackers – under the Migratory Bird Treaty Act, it’s illegal to kill grackles. Then, the birds would fly to another part of campus, where another guy with a gun was waiting. "So, it was like back and forth and back and forth," Burns says. "And, as the birds would go from one place to another, we’d shoot and, as the birds would fly in, we’d shoot. It was like, if you weren’t shooting, you were hearing someone else shoot." It was a pretty amazing sound to be in the middle of the city, in the middle of the university and you’re hearing these explosion all over,” he adds. Of course, there were complications. UT Police were supposed to notify the Austin Police Department when the shots were planned, but, sometimes signals got crossed. Burns says some officers were more understanding than others. Some members of the crew had guns pulled on them by police "several times." Then, there were the students. But, for members of UT’s grackle control crew, the important thing was that it worked. They trained the grackles to stay away from campus. "The first week we used the shotguns, we realized we were going to have a chance," Burns says. After a few years, the crew had to take out their guns less and less often. Burns says later in the '90s there were more complaints about the guns, but he thinks that’s because the new students didn’t know how bad the thing had been before. Yes, times have changed. With terrorism and mass shootings always in the news, the university’s not using shotguns to control birds anymore. John Burns' plaque for campus grackle abatement, the Flying Grackle Award. Burns says the guns have been sold, but he's held on to a few things from the experience. The file on the "Grackle War," a plaque awarded to him by UT for his service and an abiding hatred for grackles. “To this day, if there’s some up in a tree, I’ll clap real hard which will scare them," Burns jokes. "It usually hurts my hands, but I’ll still clap. I like to see 'em fly. I've seen the results of them being in an area, and it’s not pretty." Admiration for grackles seems to be growing in Austin. There's grackle graffiti, grackle T-shirts, even a bar named "the Grackle." These days some people think of the birds as equals to Austin's beloved bridge bats. But Burns isn't buying it. "I don’t think anything's ever going to change my opinion of grackles," he laughs. This is part two of our two-part ATXplained story on grackles. Visit part one here. Some birds are well-liked. Some are considered pests. Many just slip under the radar—but not the grackle. The grackle demands that you take notice. Pamela Gooby certainly did. 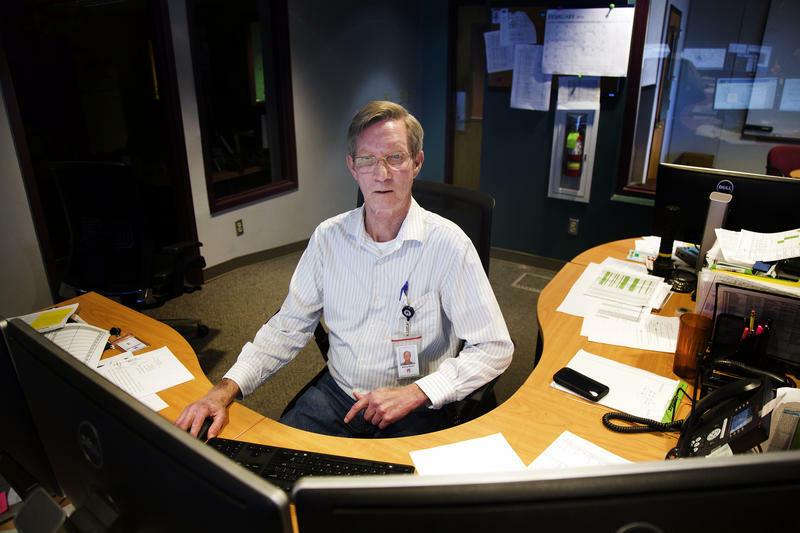 “It’s like this big velvet wave of grackle in the parking lot of the grocery store," says Gooby, whose question was chosen for this edition of KUT's ATXplained series. 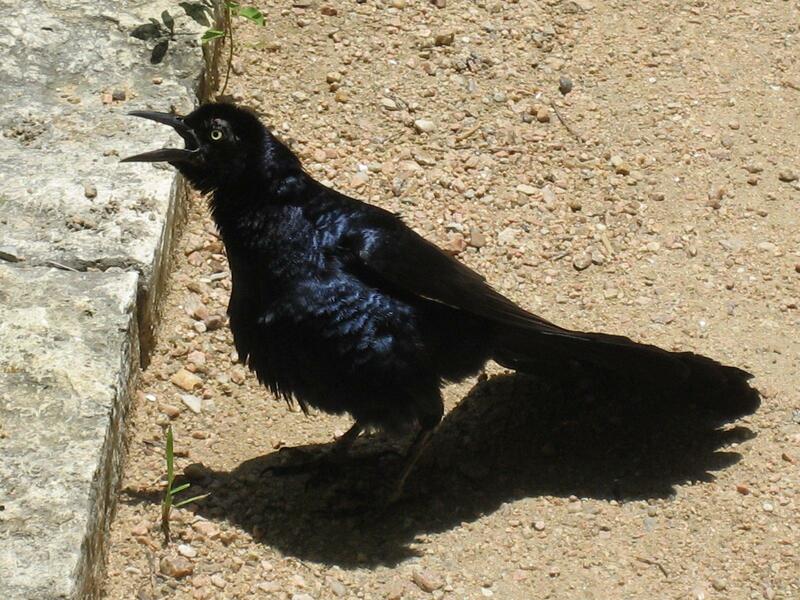 Mention the lowly-but-ubiquitous grackle to an Austinite, and you'll likely elicit a binary, typically love/hate, response. 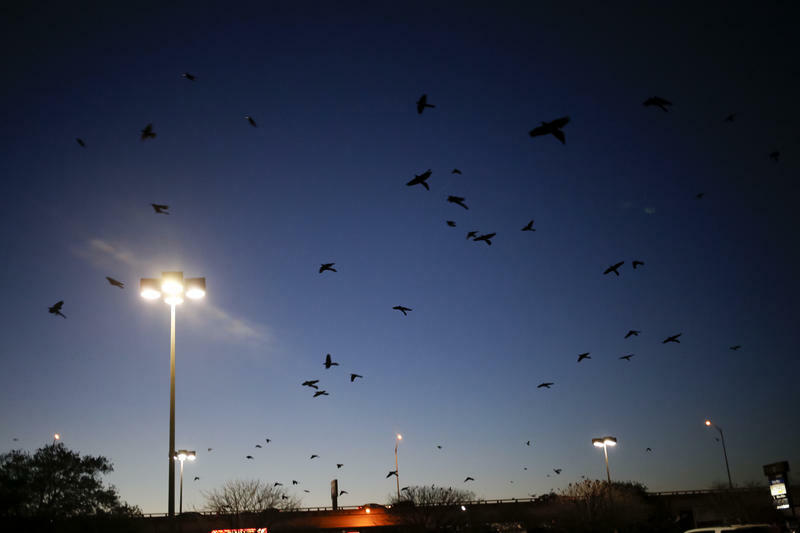 Unlike the city’s other winged mascot, the bat, which is more or less tolerated by some and celebrated by others, the grackles of Austin have been hunted, hated, loved and praised since their migration here more than a century ago. What's the Story Behind the 'Fair Sailing Tall Boy' Memorial? 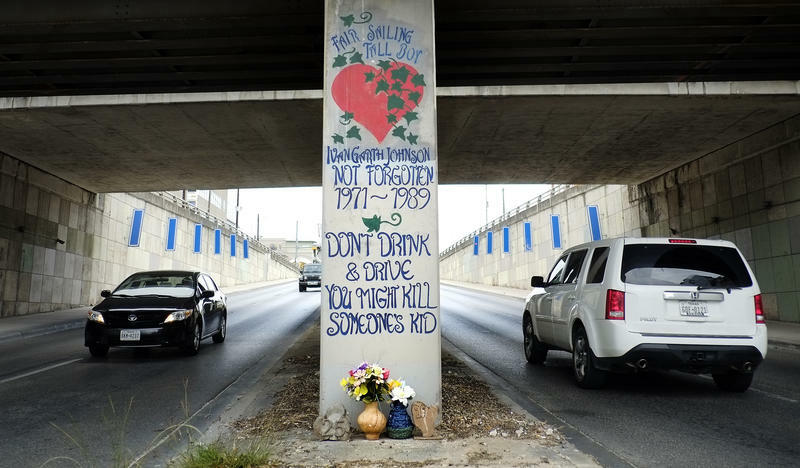 You've probably seen this memorial if you've ever driven on Lamar Blvd in Austin. It's right there, on the pillar holding up the train bridge where Third Street crosses Lamar. It says: "Fair Sailing Tall Boy. Ivan Garth Johnson. Not forgotten. 1971 - 1989. Don't Drink and Drive, You Might Kill Someone's Kid." Lynett Oliver doesn’t know Ivan Garth Johnson. She doesn’t know anything about him. But if you’re like her, you can’t help but wonder: What’s the story behind this memorial?